One of the study's authors said he blames food advertising and marketing for Americans' nearly constant eating. (Health.com) -- Over the past several decades Americans have steadily gotten fatter. 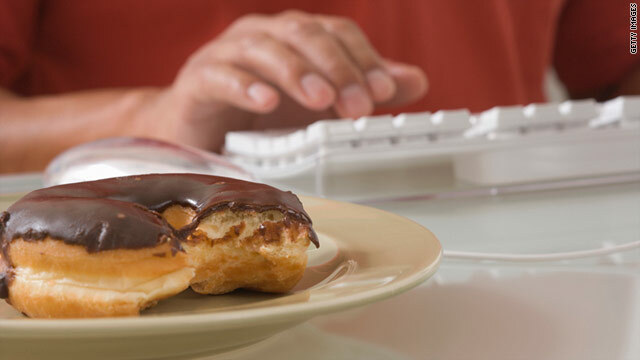 Although our increasingly sedentary lifestyles are partly to blame, a big reason for our national weight gain is that we're simply eating more. According to a new study, the biggest single contributor to the sharp rise in calorie intake has been the number of snacks and meals people eat per day. Over the past 30-odd years, the study found, Americans have gone from consuming 3.8 snacks and meals per day to 4.9, on average -- a 29% increase. The average portion size has increased, too, but only by about 12%. And, surprisingly, the average number of calories per 1-gram serving of food (known as "energy density") actually declined slightly over that period, which suggests that calorie-rich food has played a relatively minor role in our expanding waistlines. "The real reason we seem to be eating more (calories) is we're eating often," says the lead author of the study, Barry Popkin, Ph.D., a professor of nutrition at the University of North Carolina at Chapel Hill. "The frequency of eating is probably, for the average overweight adult, becoming a huge issue." "It's all about making people think they want to have something in their hands all the time," he says. "Why are we snacking all the time and munching all the time? (Food) is there, it's available all the time, it's tasty. It's not very healthy, but it's tasty. It's sweet, it's salty, it's fatty -- it's all the things we love." Lisa Young, Ph.D., an adjunct professor of nutrition at New York University and the author of "The Portion Teller," agrees that the ubiquity of snack foods has helped drive overeating. "You never used to see food staring you in the face when you went to...a drugstore," says Young, who was not involved in the new research. "It's in your face and it's cheap. You go get a magazine, you can get a candy bar." To tease apart how eating habits have shaped calorie intake, Popkin and a coauthor analyzed data from four nationally representative food surveys conducted by the U.S. Department of Agriculture and the Centers for Disease Control and Prevention between 1977 and 2006. Their analysis, which appears in the June issue of the journal PLoS Medicine, was funded in part by the National Institutes of Health. The findings weren't entirely unexpected. In a previous study, Popkin and his coauthor found that the amount of time between snacks and meals has shrunk substantially since 1977, while the amount of calories consumed from snacks has risen dramatically. Christopher Gardner, PhD, the director of nutrition studies at Stanford University's Prevention Research Center, in Palo Alto, California, says that although the new findings ring true, the survey-based approach Popkin and his colleague used has some inherent limitations. Despite being nationally representative, the surveys didn't follow the same individuals over time, and in some cases also used different questions and methods, Gardner points out. Moreover, they relied on the participants' memory of what they'd eaten in the previous 24 hours, which can be unreliable. "When people try to describe the portion sizes they are consuming, they are often inaccurate," Gardner says, adding that similar inaccuracies may crop up when recalling and calculating the energy density of specific foods. In fact, he says, the number of meals and snacks may be easiest of all to remember and track, which may have somewhat exaggerated its importance to total calorie intake. But Gardner, too, says that frequent -- and often mindless -- snacking has come to seem normal. In our food-filled environment, Young says, "We need to be conscious of when we eat, how much we eat, and what we eat." Young recommends sticking with three meals a day and choosing healthy snacks (such as fruits and vegetables) rather than processed foods. "And keep your portions in check," she says.